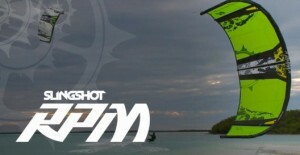 Here is a video about features and benefits of the new 2011 RPM Slingshot kite. People without soundcards, don’t worry, a text based version of the video can be read below the video. We wanted to take a kite that was acting really up to our expectations and that everyone was giving a straight feedback. And we only wanted to make it better, we didn’t wanna so much that it would give you a different feel. So you’re gonna get the same RPM as the 2010 version, we’re just gonna add a couple of things that really is benefit the kite in the way it performs. One of the key standard features is the split strut. 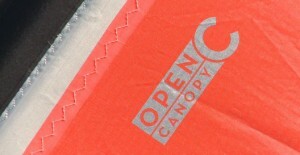 You can see it on the top of the canopy. It’s attaching the canopy to the strut in two points rather than the canopy going over attaching at a single point. It’s gonna provide a significant amount of stability and rigidity and it’s gonna beef up the durability to the canopy when it crashes and especially when it’s flying in the air, cause as you unhook it really allows the kite to hold that pocket a lot better cause the canopy is gonna be a lot more stable and firm through out your whole kite. Split strut also benefits the relaunching of the kite. It’s the same procedure as for any bow kite, just pull in a side line and the kite is gonna walk itself to the edge of the wind window and flip right up. Or you can pull both back lines and it will fly up backwards just like the Fuel. Also a feature with the kite this year. We have the same open c-canopy that is tried and true. It gives the kite a really stable and direct feel that we’ve liked for past two version of the RPM (this is the third version). Other features are of course the proprietary one pump that we have on all our Slingshot kites, the single infaltion point, you’re gonna get the struts and leading edge all in one. We have our full suspension bridle which allows the kite to perform at a very direct feel. It performs very much like a c-kite. You get all the benefits of a c-kite, but you’re not gonna lose the benefits of a bow or bridle kite. It gets a little more pocket. It gets a little more of a softer feel when you want it to and it’s not gonna be quite as abusive as a Fuel is when you’re crashing it, you miss some tricks etc. and it relaunches super easy. 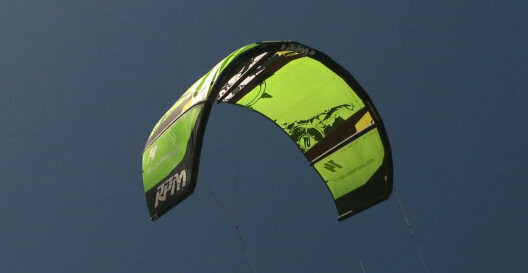 A couple of other stand up features that has been the same for the last couple of years is the superior customization of the kite. It has two different settings that you can apply. We have a wake style setting and a free style setting. So you’re wake style setting is basically to allow the kite to sit back further in the wind window. What you gonna do is to take the pigtail and move it from the forward pigtail just a couple of inches back to the rear pigtail, you can see that the length is little bit different. And the real performance that that’s gonna change it’s gonna cause the kite to sit further back in the window. So as you gonna set up for your trick, you unhook, the kite is gonna sit back there and have a little more pocket and give you little more explosive pop. A side from split strut we also have a 9 meter quiver this year, so we’re gonna offer a 4.5, 6, 8, 9, 10, 12, 14. Last year we found that when you jumped in a session from your 10 meters to your 8 meters, sometimes that 8 was quick enough but it did not have quite have that low end you’re looking for and the 10 meter had a lot of power, but it was maybe just to much if you were trying to make some free style or wake style, so that 9 is gonna be that money kite in a quiver this year, where it’s just gonna cover that middle ground and you’re really gonna be able to fill out your quiver with two or three kites. This is the 2011 RPM. Go in to your store and get one and I’m pretty sure you’ll like it!